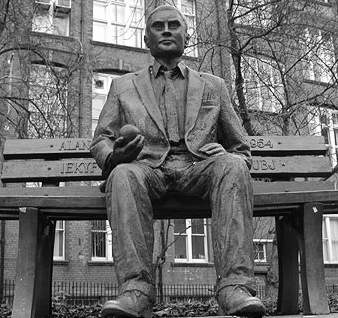 Today, 23 June 2012, is the one hundredth anniversary of the birth of Alan Turing. As indicated in the film, when Turing was 41 years old he either was murdered or committed suicide after having gone through chemical castration for the crime of being a homosexual. To say that Turing was a genius is perhaps an understatement. When one thinks of modern computers, particularly of artificial intelligence, one might be thinking of what we call a Turing machine. His one contemporary who had equivalent mathematical insights into machine "thinking" was Alonzo Church (warning, this gets into some very complex mathematical theory). These geniuses were linked by their theories which came together in the Church-Turing thesis. I often feature information about and write about the importance of LGBTQ equality. We have made incredible progress over the last century. Oscar Wilde, the great playwright, was imprisoned in the late nineteenth century and put to hard labor for the crime of being a homosexual. The twentieth century saw Turing avoid hard labor but, like Wilde, he met an early death. One can only wonder what great works Mr. Wilde might have written had he been accepted as a first class citizen and lived a full life. One can only wonder what great algorithms Mr. Turing might have developed had he been accepted as a first class citizen and lived a full life. In recent years there has been a rash of teen suicide among young LGBTQs. One can only wonder what they might have accomplished had they felt accepted as first class citizens. To be fair, one is probably no more likely to be a genius if one is gay or lesbian than if one is straight. Most LGBTQ people I know are not of genius caliber. Most are just ordinary people Ordinary people who long to be first class citizens. Not special other than how every human being is special. Wishing to not be placed on a lower tier of a caste system.